Click on map to download a PDF of the Federal Electorate of Grey. It covers 92.4% of South Australia. 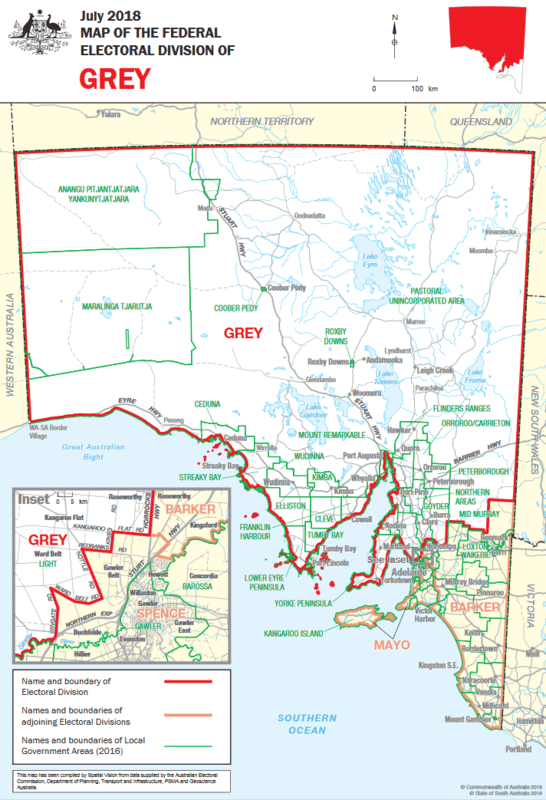 Grey covers an area of 908,595 square kilometres which stretches from the Gawler River south of Two Wells and the bottom tip of the Yorke Peninsula to the Anangu Pitjantjatjara Lands (APY Lands) reaching to the Northern Territory, Western Australia, Queensland and New South Wales borders. Grey is the third largest electorate in Australia. The cities of Whyalla, Port Pirie, Port Augusta and Port Lincoln are in the division. Towns stretch from Penong and Ceduna to Coober Pedy, Marree, Oodnadatta, Marla and Innamincka in the far north, Jamestown and Eudunda in the Mid North, Maitland and Kadina on the Yorke Peninsula. The Clare Valley and areas extending to just south of Two Wells have recently been added to the electorate. The division was named after Sir George Grey (1812-1898), Governor of South Australia from 1841-1845. Products and Industries of the area include broad-acre agriculture and pastoral grazing (wheat, wool, sheep cattle etc), mining (copper, silver, iron ore, gold & uranium) heavy industry (lead smelting, steel making), fishing (Port Lincoln has the largest commercial fishing fleet in the southern hemisphere), oil, gas, opals, wines, aquaculture, salt production and horticulture. At the 2016 election 102,059 people were enrolled to vote. Grey became an electorate in 1903. Rowan Ramsey was first elected as the Federal Member at the November 2007 election.